Back by popular demand following his sold out tour last fall, Joe is announcing a new run of summer tour dates across the US and Canada. The tour will again feature Joe, longtime bassist Graham Maby, Teddy Kumpel on guitar, and drummer Doug Yowell. The band will be visiting a number of cities that were missed on the previous tour, as well as returning to the San Francisco Bay Area for two shows (following Joe's 40 min set at Hardly Strictly Bluegrass Festival in October), Boston (where tickets for the 2015 show sold out almost immediately), and New York - where the tour will end at the historic Apollo Theatre in Harlem. The tour also includes four shows in Canada - with a few more Canadian dates to be announced soon. 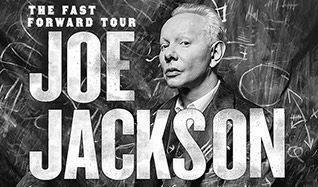 Good news for a country that has been (unintentionally) neglected on recent Joe Jackson tours. Tickets go on sale to the general public on Friday, March 25th @ 10am local venue time.